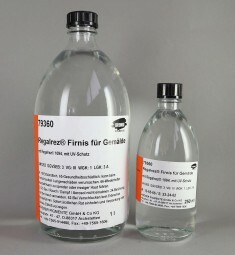 Regalrez® Picture Varnish | ... for Oilpaintings | Mediums & Varnishes | Mediums, Binders & Glues | Kremer Pigments Inc. DANGER: FLAMMABLE. HARMFUL OR FATAL IF SWALLOWED. VAPOR HARMFUL. Contains: PETROLEUM DISTILLATES, XYLENE. PRECAUTIONS: Avoid ingestion. Do not store or use near heat or flame. Use only with adequate ventilation. KEEP OUT OF REACH OF CHILDREN. FIRST AID TREATMENT: If swallowed, do not induce vomitting. Call a physician or poison control center immediately. Call physician immediately. If inhalation symptoms occur. Move to fresh air. If symptons persist, see a physician. For further health information contact a poison control center or call 212.219.2394. Customer evaluation for "Regalrez® Picture Varnish"